I am Carol Woods Ms under duress at 28 Fell View LA2 9RP: I have signed no compromise agreement and record this as the information will be needed when the matters are investigated; this time THERE WILL BE NO REPEAT OF 2006 when Lancashire police told the Investigatory Powers Tribunal that they had never heard of me and that I was really my sister living miles from Lancaster. Thus the inquiry that started, ceased immediately. No one asked me if I was me, and it took me 2 years to find out why the IPT ceased the inquiry. Firstly, it is 14 48 and I have just taken the photo of a local unemployed woman who is sent to the library EVERY TIME I arrive and she a heavy smoker is apparently ME! (At least 2 serious fraudsters in this are heavy smokers so it is to be manufactured as fact that I smoke thus anyone who obviously smokes is me. This one used stinks of cigarettes.) This is "usual" for me in harassment where the Gestapo arrange for others to use the computers BUT ONLY IF I APPEAR to log on. They have had 3 women who looked similar to each other do that IN SHIFTS for months then they replace those 3 with this roughneck. Often they use lowlife males said to be homeless as they are me as MR Carol Woods. That then is what harassment involves. Aside from what I sent out earlier in regard to serious organised fraud and worse from Fell View and the usual thieves and fraudsters organised in yet MORE of the same. Mr and Mrs K WILLIAMS in 30 Fell View have spent much of the week hiding in 30 after shouting about going out and then staying indoors. On Friday they did that again and used the phone which I hear via the ILLEGAL devices in MY loft which BT ILLEGALLY accessed my bungalow to install thus HER phone calls are where she poses as me. None of those involved could anticipate the loft noises I would hear AND THE EVIDENCE I WOULD SEE AND FILM. I also found out about 3 months ago that much of the hiding was to lure me to think I could type my word docs ready to send out via email (I have no private Internet at all) when my data was BEING TRANSFERRED to Williams in 30 where she pretended she was me typing it! Thus now I drive miles to sit in my car and type my word docs. I have spoiled her fraud BUT the phone use goes on. Jackson in 26 does the same. The loft noise woke me at 7 07 am on 22 Sept 2017; then from 9 20am there was much loud screeching (this is normal for the lowlife I "live" among) in a pretence of a phone call from a yob whose rear garden from LANGDALE at its furthest point from his council house just about touches a corner of my rear garden at its furthest point. He stands and his phone call is to be from Oct 08 with PETER GARDENER of ORBIS taking a phone call to COME TO WRECK MY HOUSE IN LANCASTER. Gardener told me he was told it was a council house and I had not paid my rent thus the yob from Langdale was to pretend that phone call was only yesterday making sure I heard "Pete" and "council" etc. The ORBIS link can all be told but is out of scope here. The Gestapo had a "plan" to "see me off" which then the lunatics and their shoutings are what they will claim are the only facts in my case. To "see me off" what was arranged? Mr K WILLIAMS thief, harasser, pest and worse in 30 Fell View was to stand about at the rear of 30 next to me in my garden at 28 to try and provoke me into a taking a photo of him provoking me. That would have resulted in ARREST of me for harassing him! I ignored him; then the rain came on so he scuttled indoors. The INTENTION was to make 23 Sept 2017 be 23 Oct 2008 again when officer Tracey Kennedy posed as me in Liverpool Magistrates Court claiming harassment of her, by me which as me posed as me meant I harassed myself. A repeat PLANNED was the farce as WILLIAMS claim to be Mr and Mrs C Woods! In among all that the postman arrived at 11 55am and despite the large sign on my door NO JUNK MAIL he left me junk mail BUT WENT NOWHERE ELSE which means that I should have had mail which was stolen from me or delivered to any other who claims to be me or linked to me for example, JANE SLATER 29 Fell View. At 12 20 a Morrison's van went by (always used when the claim in fraud is that I have just moved in somewhere and ordered the goods which would be the loft noises from the 21st) and DPD arrived at 17 Fell View, JOANNE NOLAN but he drove off as I took a photo; he made no delivery. Nolan has been paid for over 2 years now to pretend to be my daughter, driving me about in the car PG03 WGU a blue Skoda. To do that she often uses the rear yard of 29 Fell View to hide in the car and then simply drives off when I do and that is apparently proof she drives me. THE MAIL THEFT MUST BE INVOICES AND BANK STATEMENTS FOR ALL GOODS DELIVERED IN FRAUD. One week ago I also saw, by chance, ANOTHER used to claim links to me, a total stranger was rushing to alter a CAR REGISTRATION document to DVLA which was done when I moved to Fell View and then I found a car PF08 WDJ a black Mitsubishi Colt was used in a fraud whereby the old thief driving it claimed to be my dead mother and I as her daughter was driving her about. THUS THERE MAY BE ANOTHER OF THE SAME FRAUD UNDERWAY. I will alert DVLA a.s.a.p. On 22/9/17 after loft noises again which told me Williams had only pretended to go out but were indoors using a phone, a taxi arrived at 29 Fell View the 32090 firm used a great deal which cars YOU pay and which pretend to drive me about as if I am someone else. I took his photo: no one alighted or got in; he drove off in a rush but it is clear that 29 Fell View is "in the frame" again. Her car is a dark blue, small Ford AF07 XLL and see this, 41 Fell View Mr and Mrs Jarvis who claim I have lived with them for almost 3 years they aided by council (e.g. in PE08 ZRX, PE56 NXB and LT59 FGN so they can be identified) who set up bank accounts and paid in monies AS IF I DID LIVE THERE NEEDING SUCH NEANDERTHALS TO CARE FOR ME AND DRIVE ME ABOUT using a large dark blue Ford, GN07 AHO. Notice how cars are found for fraudsters to hopefully confuse investigations. One week ago I caught the Gestapo using a squad car to pretend they were "escorting" Jarvis with their invisible passenger ME to 41 Fell View. Given the lunacy leading to complexities, I try to keep the data brief. Ends..... Please feel free to quote me. The question has been asked: “why would the “Powers That Be” target someone such as Carol Woods for so long [since 2006], involving so many perpetrators, committing so many serious crimes, funded by the public and local council taxpayers?”. 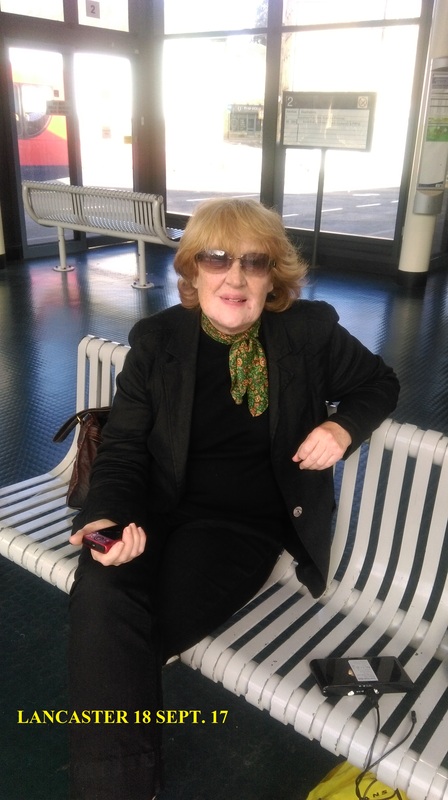 Carol Woods is a 63 years old former Lancashire County Council Level 3 Social Worker and Child Protection Officer [who used to train social workers] and a former Probation Officer, amongst many other things. Perhaps the appalling and chronic targeting she has no choice but to put up with 24/7 is because she reported numerous seriously grave irregularities she discovered, including child abuse, when being employed by Lancashire county council, as described in the “IMPORTANT VIDEOS” at the foot of this post, and also because of what Carol has reported, especially here, from Feb. 2007: “York LGO Blog and Lancashire CC” http://www.criticalreader2006.blogspot.ae/. Today 23/09/17 I visited a nearby town [a usual event for a Saturday] + picked up a stalker [who was obviously working with others as I’ve often been stalked whilst visiting this town as I have many other towns – a short fat 12 yr old male, very cocky with it too] who boarded the bus on the return journey once they knew I was on it + who alighted at the same stop as me + proceeded to ask me a stupid question asking for a street that he claimed was nearby but, in reality, didn’t actually exist!! this was a short fat 12 yr-old male – they often use small children or scruffy adults, or and especially gormless looking teenage females!! This stalking is truly crazy and ridiculously amateur and has been going on since 2010 directly after I contacted my local police via visiting the local station and emailing them [both to no avail] trying to report the Hollie Greig abuse case. I duly put up 2 posters near me shortly after my visits + emails which stated “GOOGLE HOLLIE GREIG – STOP THE COVERUP!” [a bright green poster with black writing which has been used at RCJ demos in the past] which were immediately taken down directly after I contacted my local police – 1 poster was in my local post office window – the owner of which claimed he was getting a new shop front and had to take my poister down after I asked him why my poster was taken down after a couple of days after I’d paid for it to be shown, but then the guy refused to replace it once the shop front was renewed, despite other notices being put up + shown as before. The other poster was on a near-by lamp post which was also taken down at the same time, just after I visited my local police. Shortly after this the surveillance on myself began in earnest and has taken many forms – from electricity surges [which blew my appliances] to internet hacking [still happening], to being followed and trhe preprogramming people I have to visit which is very much still happening [eg.my gp, hospital and so many others] to numerous council employees visitis, to recently AND PARTICULARLY many local neighbours living alongside myself, – and indeed in my very own flat’s block – stalking myself en masse. It iso easy to spot this outlandish behaviour and so very amateurish too, as it would be using the general public to do one’s dirty work – they stare at me with abject curiosity often giving their game away 100% – something I can easily work around. My original message to Lancs. police re: the illegal tracking device installed in Ms. Woods vehicle - 31 March 2017 =? I am writing to you concening the tracking device installed in the motor vehicle used by Ms. CAROL WOODS. Ms Carol Woods address is: 28 Fell View, Caton, Lancashire, LA2 9RP. "The UK vehicle tracker laws fall under the category of processing personal data and accordingly, it is governed by the Data Protection Act 1988. In order to ensure vehicle tracking legality, it is vital that organisations maintain a vehicle tracking policy that is fully transparent and compliant with the Data Protection Act. Under this Act, persons who have tracking devices installed in the vehicles they own have the right to know what information is being held about them and the purpose for which it will be used. For this reason, collecting data covertly is considered to be in breach of the law. •It is necessary in order to protect the vital interests of the subject". b] Ms. Woods has the right to know what information is being held about her and the purpose for which it will be used, but she has never been told anything regarding her motor vehicle being tracked. "Article 8 of the European Convention on Human Rights provides a right to respect for one's "private and family life, his home and his correspondence"
Ms. Woods right to privacy has clearly been breached by the interference of this tracking device installed in her motor vehicle. "I have asked specifically for the data in relation to PERMISSION for GPS sought and then gained, and paid £10 but received nothing. I TOOK my £10 in Jan 2017 after asking if I needed to pay £10 via data.protection@lancashire.pnn .police.uk Jan this year, it was acknowledged as received as I drove all the way to HUTTON HQ, to deliver it (I asked them to formally acknowledge receipt) as well as getting a receipt there at the front desk". Therefore Ms. Woods has applied for the information regarding the tracking device in her vehicle, but not received any information in return - an extremely serious irregularity. Can you please remove this device from Ms. Woods motor vehicle that is clearly falling foul of the statutes in place - those being the Data Protection Act 1998 and the Article 8 of the European Commission of Human Rights? Mr. Finnegan, failure to acknowledge this communication will result in my contacting the highest authorities regarding these breaches of the said statutes stated above. JOHN PILGER "THE KILLING OF HISTORY"